This is a small-size assignment, with a two-week lifetime. Create a web app that enables employees to write and manage notes. In many organizations, employees make notes about their daily activities. One or more notes per day can be created by the employee. The notes are private, such that one employee cannot view the notes made by another employee. Get the “Assignment 2 base project” from the course’s My.Seneca/Blackboard ‘assignments’ storage area. The Register method in the Account controller was fixed. It had two problems: 1) It would not tell you if your password was invalid, instead, it simply threw an error. 2) It would not tell you if the user account already existed, instead, it simply threw an error. You will not be able to change the password for this account. Add the ability for an Employee user to see details about their Employee object. Already done. Includes design model classes for Employee, Note, and OU (‘organizational unit’). The Employee class describes an ’employee’ entity. It has an optional to-one relationship with itself, for a property named Manager. It also has a to-many relationship with itself, for a property named DirectReports. In addition, Employee is logically linked to the ApplicationUser class, with a string property named “IdentityUserId” that represents the unique identity of the ApplicationUser class. Is this good enough? Yes. Read the March 26 & March 30 notes to learn how ASP.NET Identity defines, configures, and uses identifiers. The Note class describes a ‘note’ entity. 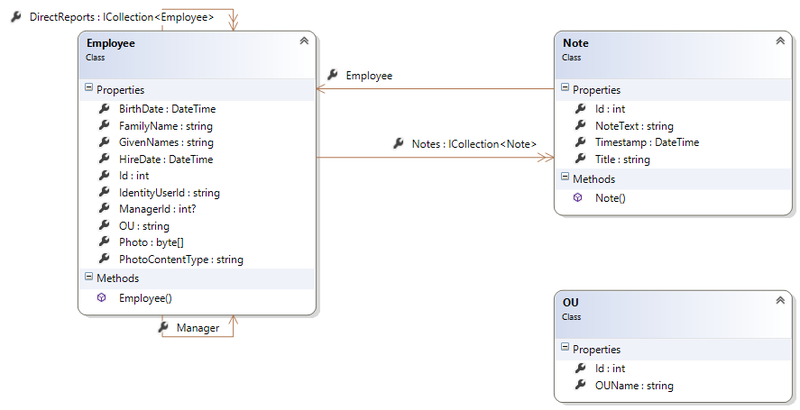 An employee object can have zero or more note objects in a collection. An individual note object MUST be associated with an employee object. The OU class (‘organizational unit’) describes an ‘organizational unit’ entity. In some organizations, these are named ‘departments’, or ‘divisions’. In our academic environment, these can be named ‘school’, ‘faculty’, or ‘department’. The terms vary. The OU class will be used simply as a lookup table, to get the OU name. Therefore, it is NOT associated (using navigation properties) with the other classes. The following is a class diagram that will guide your design. Click to open full-size in its own tab/window. Employee data was generated using Mockaroo.com, and saved as a comma-separated values file. The data is at the bottom of this document (scroll down to view the data). Study the Configure class in the base project. You will see that it loads the data into your app, using the technique you recently learned. The Configure class also creates eight (8) organizational unit values. If you do not like these values, you can use any kind of organization as a model, including academic (e.g. School of ICT, School of Business, Finance, IT Services, etc. ), business (Sales, Manufacturing, Human Resources, etc. ), or anything else that interests you in business, entertainment, or anywhere else in human society. The app’s home page will be open to anonymous users. Obviously, the ‘register’ and ‘login’ pages will also be open. However, other features of the app require authentication. The ‘create an account’ (aka ‘register’) functionality will be successful ONLY for employees. Study the code to learn how this happens. Notice that the admin user’s password is Password123!, which satisfies the rules. The app should have only one administrator. This user is programmatically created when the app loads for the first time. Study the Configuration class. The administrator will be able to view a list of employees. An administrator can NOT view notes made by other managers or employees. An administrator will be able to configure an employee as a ‘manager’. A manager is an employee with one or more items in its DirectReports collection. A manager will be able to select employees as DirectReports. Also, a manager can view a list of their employees. Your ‘manager’ class will need methods that ensure that the right employees are selected and returned. A manager can NOT view notes made by other managers or employees. An employee can view their Employee object details. An employee will be able to view a list of their notes. An employee can create, edit, and delete a note. The note’s body text – the NoteText property – must be rich text. As you would expect, an employee will not be able to view notes made by other employees. As noted above, all user interface elements must be styled with Bootstrap. Your app must use a theme that’s different from the default project template theme. Copy-paste the following data to a plain text file in your project’s App_Data folder. Then, import the data using the CsvHelper library.